A ContextAwareFixture is a Fixture which has an ExecutionContext as one of its elements. Such a Fixture ensures that its setup and teardown actions are done within its .context , and that tests using it are also run within its .context . A session-scoped Fixture which sets up all the basics any Reahl system needs to run. Upon set up, it creates a new empty database with the correct database schema for the project and sets up any persistent classes for use with that schema. It also connects to the database. Upon tear down, the Fixture disconnects from the database. To be able to do all that, it needs to provide a basic ExecutionContext with the appropriate configuration, which it reads from the ‘etc’ directory relative to the current directory. You should not use this fixture directly in tests because changes to, eg. the ExecutionContext it provides will persist between different tests. The idea is for ReahlSystemSessionFixture to be used by other Fixtures that are not session scoped, but that uses this one where necessary. See for example ReahlSystemFixture. The main Configuration of the system. This is read from disk from the ‘etc’ directory present in the current working directory where tests are run. The ExecutionContext within which all tests are run. The SystemControl with which you can control the underlying database. A Fixture for direct use in test which sets up all the basics any Reahl system needs to run. ReahlSystemFixture does its work by using a ReahlSystemSessionFixture behind the scenes. ReahlSystemFixture provides copies of most of the session-scoped stuff in the ReahlSystemSessionFixture. This allows you to “inherit” the configuration set up for the session by default, but also allows you to change the configuration and ExecutionContext for a particular test, safe in the knowledge that such changes will be torn down after each test function ran. SqlAlchemyFixture ensures that a transaction is started before each test run, and rolled back after each test so as to leave the database unchanged between tests. It also contains a handy method persistent_test_classes() that can be used to add persistent classes to your database schema just for purposes of the current test. 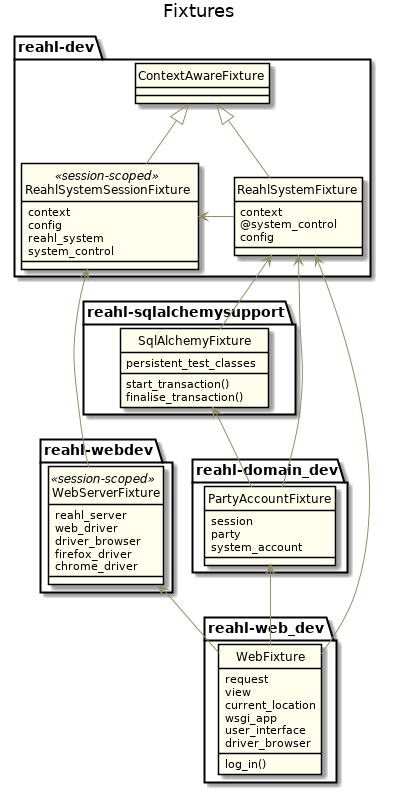 A context manager that creates the tables needed for the entities passed to it, and which sets the necessary SqlAlchemy wiring up for thos entities to work. The tables are destroyed again after the context is exited. This is useful for having persistent classes that may even need their own tables in the database but which should stay part of test code only, and are thus not listed in the <persisted> section of any egg. A Fixture to be used as session fixture. It sets up a running, configured web server before any test runs, and more than one flavour of a Selenium 2.x WebDriver. WebServerFixture also stops all the necessary servers upon tear down. The web server started runs in the same thread as your tests, making debugging easier. The reahl.webdev.webserver.ReahlWebServer for this test process. A WebDriver instance set up to work with the running reahl_server , via Firefox. The default WebDriver instance (Chrome, by default). A function-scoped Fixture for use when testing a website via selenium or to test things as if you are inside the server. For example, it supplies a View for when you want to instantiate a Widget. Logs the user into the current webapp without having to navigate to a login page. A DriverBrowser instance for controlling the browser. A selenium WebDriver instance for Chromium. A selenium WebDriver instance for Firefox. The default selenium WebDriver instance. To use it, you will have to call set_app() to specify the WSGI application to serve. Creates a ReahlWSGIApplication containing a UserInterface with a single View. enable_js – If True, JS files will be served. The default is False, to save time. config – A configuration to use. child_factory – A Widget to include in the single-view site (only applicable if no site_root) is given. The current Url as displayed in the browser location bar. An UrlBoundView to use when constructing Widgets for testing. A WidgetTester is used to render the contents of a reahl.web.fw.Widget instance. widget – The Widget instance to be tested. The HTML rendered by the Widget. Returns the HTML rendered by the Widget. Returns an lxml tree of HTML elements rendered by the Widget. locator – An instance of XPath or a string containing an XPath expression. Returns the HTML of the children of the element targeted by the given locator (excluding the element’s own tags). Answers the number of elements matching locator . Returns the lmxl Element found by the given xpath . A Browser that can be used to test a WSGI application in the current thread, without the need for a separate web server. This class implements methods matching the actions a user would perform using a browser. wsgi_app – The application instance under test. GETs the URL in url_string . url_string – A string containing the URL to be opened. follow_redirects – If False, this method acts as a simple GET request. If True (the default), the method hebaves like a browser would, by opening redirect responses. relative – Set to True to indicate that url_string contains a path relative to the current location. Other keyword arguments are passed directly on to WebTest.get. GETs the previous location (like the back button on a browser). GETs the current location again (like the refresh button on a browser). Assuming the last response received was a redirect, follows that response (and other redirect responses that may be received in the process until a response is received which is not a redirect. POSTs the given form values to the url given. url_string – A string containing the URL to be posted to. form_values – A dictionary containing form data in its key/value pairs. Other keyword arguments are passed directly on to WebTest.post. Returns the HTML for the current location unchanged. Returns the HTTP status code for the last response. Returns the title of the current location. Returns the current location url path. Returns the the last request scheme(HTTP/HTTPS). Return the form for the given locator . Types the text in text into the input found by the locator . text – The text to be typed. Clicks on the element found by locator . Other keyword arguments are passed directly on to Form.submit. Finds the select element indicated by locator and selects one of its options. label_to_choose – The label of the option that should be selected. Finds the select element indicated by locator and selects the options labelled as such. labels_to_choose – The labels of the options that should be selected. Finds the select element indicated by locator and ensure nothing is selected. Returns the value of the input indicated by locator . Answers whether the located image is available from the server (ie, whether the src attribute of an img element is accessible). Creates a cookie from the given cookie_dict . Answers whether the located element is reactive to user commands or not. For <a> elements, this means that they have an href attribute, for inputs it means that they are not disabled. A Browser implemented by a supplied Selenium WebDriver instance, but with interface matching (or similar to) Browser. web_driver – The WebDriver instance to be wrapped by this DriverBrowser. host – The hostname of the machine used by default for URLs. port – The port used by default for URLs. scheme – The URL scheme used by default for URLs. Answers whether the element found by locator is responsive to user activity or not. Waits until the the element found by locator is present and becomes responsive to user activity. Answers whether the element found by locator is actually being displayed by the browser as well as responsive to user activity. Waits until the element found by locator is being displayed by the browser as well as responsive to user activity. Answers whether the element found by locator is being displayed by the browser. Answers whether the element found by locator has a value equal to the contents of value . value – The (text) value to match. attribute – The name of the attribute to check for. Waits until condition is satisfied. If condition is not satisfied after a timeout period of 2 seconds, an exception is raised. condition – A function, method or other callable which will be called periodically to check whether a certain condition holds. It should return True if the condition holds, False otherwise. Extra positional and keyword arguments to this method are passed on as-is in the calls to condition . Waits until the given condition is not satisfied. See DriverBrowser.wait_for(). Waits for the element found by locator to become visible. Waits until the element found by locator is not visible. Answers whether the current page has finished loading. Waits for the current page to load. Waits until the element found by locator is present on the page (whether visible or not). Waits until the element found by locator is not present on the page (whether visible or not). wait – If False, don’t wait_for_page_to_load after having clicked the input. Types the text in value into the input found by the locator . wait – If False, don’t wait_for_page_to_load after having typed into the input. Moves the mouse pointer over the element found by the locator . Puts the tab-focus at the element found by the locator . Returns the reahl.web.fw.Url of the current location. Returns the value of the HTML attribute of the element found by locator . attribute_name – The name of the attribute to return. arguments – Variable positional args passed into the function as an array named arguments . Returns the contents of the element found by locator , as plain text. Answers whether the element found by locator can be edited by a user. Answers whether the <a> element found by locator is currently clickable. Answers whether the CheckBoxInput element found by locator is currently checked. Ensures the CheckBoxInput element found by locator is currently checked. Ensures the CheckBoxInput element found by locator is currently not checked. cookie_dict – A dictionary with two required keys: ‘name’ and ‘value’. The values of these keys are the name of the cookie and its value, respectively. The keys ‘path’, ‘domain’, ‘secure’, ‘expiry’ can also be set to values. These have the respective meanings as defined in RFC6265. Removes all cookies fomr the browser. Takes a screenshot of the current page, and writes it to output_file . The image is cropped to contain only the parts containing something other than the background color. output_file – The name of the file to which to write the screenshot. background – The color to use as background color when cropping. Simulates the user pressing the tab key on element that is currently focussed. Simulates the user pressing the backspace key while the element at locator has focus. An object representing an XPath expression for locating a particular element on a web page. A programmer is not supposed to instantiate an XPath directly. Use one of the descriptive class methods to instantiate an XPath instance. An XPath expression in a string is returned when an XPath object is cast to six.text_type. Returns an XPath to find an HTML <label> containing the text in text . Returns an XPath to find an HTML <h> of level level containing the text in text . Returns an XPath to find an HTML <caption> matching the text in text . Returns an XPath to find an HTML <option> containing the text in text . Returns an XPath to find an HTML <table summary=’…’> matching the text in text in its summary attribute value. Returns an XPath to find an HTML <a> containing the text in text . Returns an XPath to find an HTML <a> containing text that starts with the contents of text . Returns an XPath to find an HTML <p> that contains the text in text . Returns an XPath to find an HTML <input> with the given name. Returns an XPath to find an HTML <input> referred to by a <label> that contains the text in label . Returns an XPath to find an HTML <select> referred to by a <label> that contains the text in label . Returns an XPath to find an HTML <input> with type attribute input_type . Returns an XPath to find a FieldSet with the given legend_text . Returns an XPath to find an ButtonInput whose visible label is the text in label . When extra keyword arguments are sent to this method, each one is interpreted as the name (kwarg name) and value (kwarg value) of an Event argument which this ButtonInput instance should match. Returns an XPath to find a Label containing the error message in text . Returns an XPath to find a Span containing the message in text . Returns an XPath to find a Div containing the message in text . A web server for testing purposes. This web server runs both an HTTP and HTTPS server. It can be configured to handle requests in the same thread as the test itself, but it can also be run in a separate thread. The ReahlWebServer requires a certificate for use with HTTPS upon startup. A self signed certificate has been provided as part of the distribution for convenience. config – The reahl.component.config.Configuration instance to use as config for this process. port – The HTTP port on which the server should be started. The HTTPS port is computed as this number + 363. Creates a new ReahlWebServer given a port and standard configuration directory for an application. directory – The directory from which configuration will be read. port – The HTTP port on which the server will be started. Changes the currently served application to new_wsgi_app . Starts the webserver and web application. in_separate_thread – If False, the server handles requests in the same thread as your tests. connect – If True, also connects to the database. Stops the webserver and web application from running. Call this method once to have the server handle all waiting requests in the calling thread. Installs this server’s request handler into the given web_driver . This enables the server to serve requests from the web_driver in the current thread. Returns a context manager. Within the context of this context manager, the webserver is temporarily run in a separate thread. After the context managed by this context manager is exited, the server reverts to handling requests in the current (test) thread. wait_till_done_serving – If True, wait for the server to finish its background job before exiting the context block.